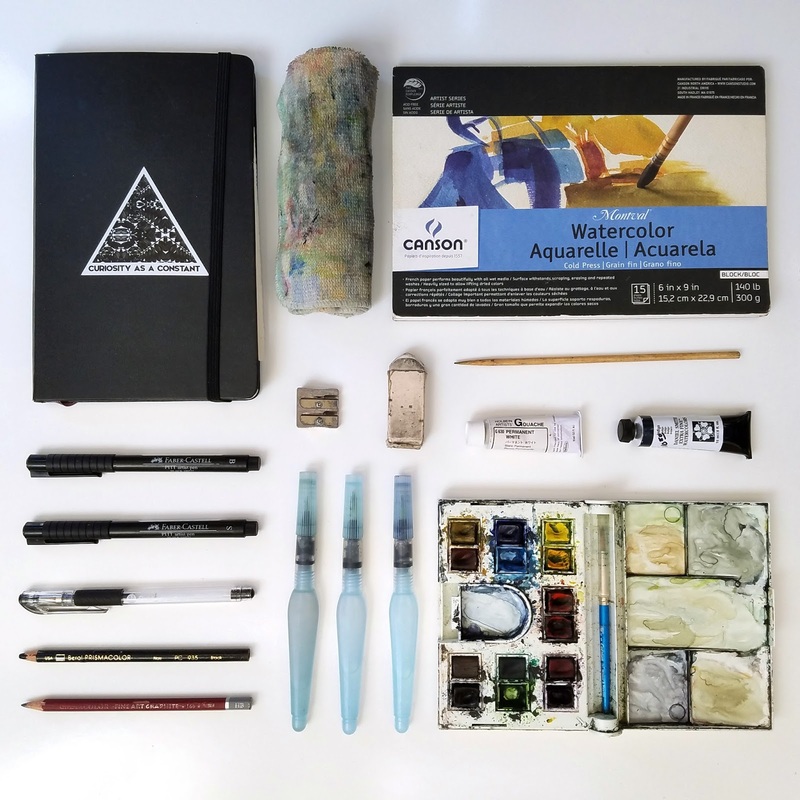 A lot of people have been asking about my watercolor field kit lately, so I wanted to share in more detail what I carry with me and where to get everything. So here's everything, starting at the top left and working clockwise to spiral into the eraser last. Moleskine Art Plus Sketchbook, 111 lb paper, 5x8.25 "
I'm a combo journaler, sketcher and painter, so I prefer a sketchbook that can do it all. This 111 lb paper takes sketches, pencil and writing beautifully. It can handle up to 2 washes of watercolor before it starts to get messy. The key here is to go easy on the water and work quickly. Sure I could get a true watercolor sketchbook like the Moleskine Watercolor Album Sketchbook, 135 lb paper, but then I'd have less pages and I'd feel bad about writing my "to do" lists alongside a painting. A choice of sketchbook is very personal. I'm not completely sold on these, but I appreciate their lay flat design, the stretchy bungie to keep it closed and the classic black exterior. I like covering them with stickers, like this one from She Explores. I carry an old rag with me in my kit to help clean brushes, sop up messes or blot paintings. Honestly this is an old washcloth that I've had since I was like 4 - it's practically a family heirloom. You could also carry paper towels, but this is way better for the environment. Throw it in the wash every once in awhile. Montval Canson Watercolor Block, 6x9"
When I want to paint on real watercolor paper, I grab this handy little watercolor block. This is 140lb paper and is already glued down, so you don't need tape or anything to hold you paper down in the wind. This is good decent paper in a really great size to fit in your backpack or satchel. A wooden stick is handy for a number of things - putting your hair into a bun when you forgot a hair tie, poking & scratching things, but mostly it's to make marks in wet watercolor. Use it to scrape paint away, draw lines in the paint, or push it into small spaces. My paint kit is pretty good on colors, but it doesn't come with indigo, which is my all time favorite color. So I squeeze some extra into the palette and use it in every painting. One of the biggest lessons I've learned as an artist - use whatever colors you like and make you happy. For the times negative painting just won't cut it, you just need white. 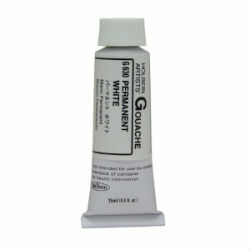 Holbein Artists' Gouache is an opaque white that mixes great with all your watercolors. So any time you need to go opaque with your paints or need to add white on top, squeeze out what you need into your palette. Note, unlike watercolor pans that just need water to activate, gouache dries out and is then done. So only use what you need for a given sitting. Back when I first started painting with watercolors, I picked up this compact palette. It seemed like a good mix of colors and palette size and a good price. Even after all these years, I still use the same set and am still quite pleased with it. There are a number of different size options and color sets. Pick the one that speaks to you. Remember, you can always change out the colors if you don't like them. You can buy new half pan watercolors for this kit here in any color you like. And if you run out, you can always squeeze watercolor from the tube straight into the empty pans. These are so easy to travel with and you can take them through security when flying. My Winsor & Newton palette was stolen along with my purse and sketchbook last month, so I picked up this new black metal one, which I love. I swapped out a couple of colors that didn't work and I also love the finger loop on the bottom of the palette to get a better grip. I have spoken ad naseum about water brushes. I love them and don't go anywhere without them. I use these exclusively when I am painting on the go. You fill the reservoir with clean water, then dip the wet brush into your palette and paint away. If you need more water, squeeze the reservoir and more will come out. To clean, simply squeeze water and wipe the brush on your rag. I paint with these in the car, on the plane, sitting on the top of a mountain or in my living room. There are many brands out there, but this is a good buy and you get 3 sizes. Draw with whatever pencil you like. The one from your junk drawer, your kids school pencil, a fancy graphite thing. Whatever you like. For my field kit, I happen to like HB pencils. The HB refers to the hardness of the graphite and in this case HB is pretty soft and light. That way my under pencil sketches aren't obvious, don't make hard marks on the paper and are easy to erase. There are times however when I want to sketch and when I do, I switch to a black Prismacolor Pencil. This is just a black colored pencil. The beauty is you can sketch, shade, create gradients, but it won't smear. I hate smearing a graphite drawing, especially in you're beautiful sketchbook! Don't smear. In my sketchbooks, I also journal a lot. I write about my day, my dreams, painting ideas, our travels. But I am super picky about my writing tools. Right now I'm way into these Pental Arts Hybrid Technicas. I use the 0.3 mm thickness, but comes in thicker as well, 0.4-0.8mm. For some reason, I just really like the fine lines this creates, it doesn't smear or leave drops. It's a clean, precise pen. If they could make the ink waterproof it would be the perfect pen. Speaking of permanent, waterproof pens. 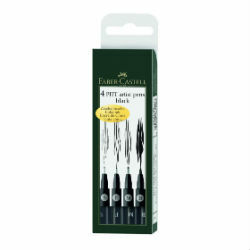 For linework and and pen drawing where I use watercolor, I use these Faber Castell PITT Artist Pens. I bought this 4 pack with a S, F, M and B sizes. Somehow I've lost he F & M, but I have the Small and the thick Bold one still. You may be familiar with Micron pens, which are very popular. These Faber Castells are the same thing, but I seem to have better luck with these tips. I was always destroying Microns, so I found these. Use whatever you like, it's a personal preference. I wish I had a fancy, pretty brass pencil sharpener like these!! But I just have a boring 2-hole silver one. Frankly, you probably have a pencil sharpener in your junk drawer or in that box of school supplies from college, or your kid has one they don't use anymore because they do all their school work on a computer now. BUT, if you don't, get one of these to make you happy when you sharpen pencils. There is nothing special about my erasers, they just have to erase. And I've used the same one for years now. *Please Note* This post contains affiliate marketing links to products I use or recommend. If you click through and purchase from my link - I get a little commission. Every little bit helps right?